A great tasting organic blend of Bragg organic apple cider vinegar and nature’s organic honey. Use to make into a drink or use as a topping over cereals, fresh fruits, yogurt, salads or use as a marinade or for stir-fries and other recipes. 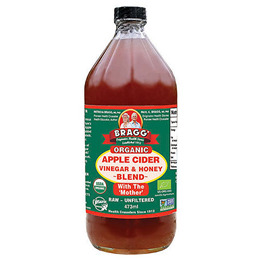 Organic Honey and Bragg Certified Raw, Organic Apple Cider Vinegar. Enjoy 3 times daily or anytime you want a refreshing drink. Shake well before using. Below are reviews of Bragg Organic Apple Cider Vinegar & Honey Blend - 473ml by bodykind customers. If you have tried this product we'd love to hear what you think so please leave a review.